After reading Dr. Pipslow’s Short and Simple Guide to Making Trading Resolutions for 2018, however, I realized that I’ve never really delved too much into other trading methods. In other words, I’ve never really gone out of my comfort zone as a trader. I therefore resolved to do just that in 2018. And the way I’ll do it is to create a trading system from scratch. But here’s the clincher: the trading system must be the complete opposite to my current trading framework. I therefore invite you, my wonderful friends, to join me in this journey of discovery and adventure. And hopefully, my journey will also help you in your own personal journey as traders. Before you read on, do note that I won’t be giving the trading rules for my trading system here. I’ll be presenting those in a separate post. You see, this write-up is for me to share my thinking process when it comes to crafting a new trading system. So if you’re looking for a new trading system to test out, then you’ll have to wait for my later posts. But if you want to create a trading system of your own, but you don’t have any idea where to start, then this will hopefully help you out. First things first! Before I develop and backtest a trading system, I want to define some goals so that I can narrow down my focus. If I don’t do that, I’ll probably just keep on tweaking and tweaking the system without any sense of direction or feeling of completion. Do note that these goals are based on my own trading psychology, so your own trading goals may be different from mine. If you, for example, can tolerate a 30% peak-to-trough drawdown, then go ahead and use that for your trading system goal. And if you also noticed, I didn’t define my goals in terms of gains because I plan to play defensively and opportunistically. In other words, my priority (for now) is capital preservation over capital growth and I’ll only take what the market is willing to give me. I may still decide to define a growth target later on, but that will likely come after I’m done developing the trading system. Now that I’ve jotted down my goals, it’s time to define my trading system parameters so that I can limit my focus even further. First and foremost, I need to define how much to risk per trade while keeping in mind my goal that the peak-to-trough drawdown must not exceed 20%. Since I’ll be crafting a mechanical day-trading system, I have to take any and all trades even if experience and/or fundamentals tell me otherwise. As such, I already anticipate that there will be plenty of losing streaks. My risk per trade must therefore be small enough so that I can survive several consecutive losses. And to that end, I’ve decided to risk 0.5% of my account per trade since that means up to 40 consecutive trades before I reach my peak-to-trough drawdown threshold of 20%. Is there a chance that the trading system will have a losing streak in excess of 40 consecutive trades. Of course! If that’s the case, then my options are to either reduce my risk per trade or go back to the drawing board and tweak the system. Next, I need to define my timeframe. Since I’m building a day-trading system, my timeframe must obviously be smaller than the daily chart. However, one constraint that I didn’t mention is that I have other daily tasks that usually require my complete attention for 30-40 minutes at a time, which means that the 30-minute chart and anything below that are disqualified. This also means that a scalping strategy is not practical in my case, so I’ll likely go with a momentum-based day-trading setup. Anyhow, this leaves the 1-hour chart and the 4-hour chart as the only viable timeframes. And I think I’ll go with the 1-hour chart. After all, my goal is to have at least one new trade per day and a 4-hour chart greatly lessens the chance for achieving that. With that out of the way, the next thing I need to decide on are the currency pairs to focus on. For now, I think I’ll go with GBP/NZD, but I’ll probably expand to other pairs after I finalize the trading system. As to why I decided to choose GBP/NZD, well, I actually applied statistical analysis but the short of it is that GBP/NZD is highly volatile and there are strong intraday trends, which makes it ideal for day-trading. There are two downsides when trading GBP/NZD, though, namely the relatively higher spread and negative rollover when holding a long position overnight. However, I won’t be scalping so the higher spread is not that big of a problem. The negative rollover, meanwhile, will only become a problem if I hold a lot of trades overnight. But since I’m building a day-trading system, I probably won’t have to deal with that too often. Finally, I have to address my objective to create a trading system that’s reactive rather than predictive. This means that I will only use stop and market orders for my entries because limit orders are inherently predictive in nature. After all, you set a limit order because you expect price to reach that price level and you expect that price level to hold either as support or resistance. Ideally, I’d be using stop entries exclusively since I want to go wherever price action is going, but I can already foresee instances when I may need to enter at market, so I might as well allow market orders from the start. Okay, I’ve got my goals and parameters down pat. Now I need to identify what the “core” of my trading system will be. 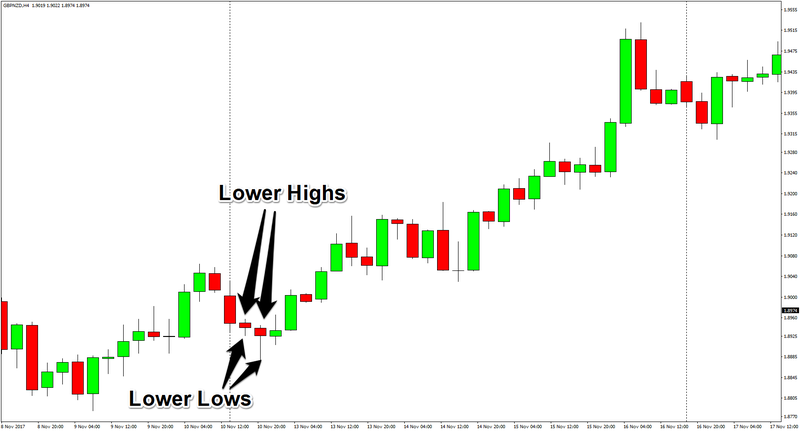 The most common practical applications of the first trading principle can be found in chart patterns and the inside bar pattern. Chart patterns are too subjective and best used for discretionary trading, though. The inside bar pattern, meanwhile, can easily be used in a mechanical manner, so I’ll go with the inside bar. Heck, Robo Pip’s Mechanical Inside Bar Momentum Strategy raked in solid returns in 2017, so not only did he (she? it? they?) show that the inside bar can be used mechanically, he (she? it? they?) also showed that the inside bar has an edge over the market, so I definitely want to use the inside bar. As for the second principle, I’ll focus only on reversal candlestick patterns like the hammer and the shooting star. Well, I won’t really be using candlestick patterns since they are also subjective and discretionary to a certain degree. 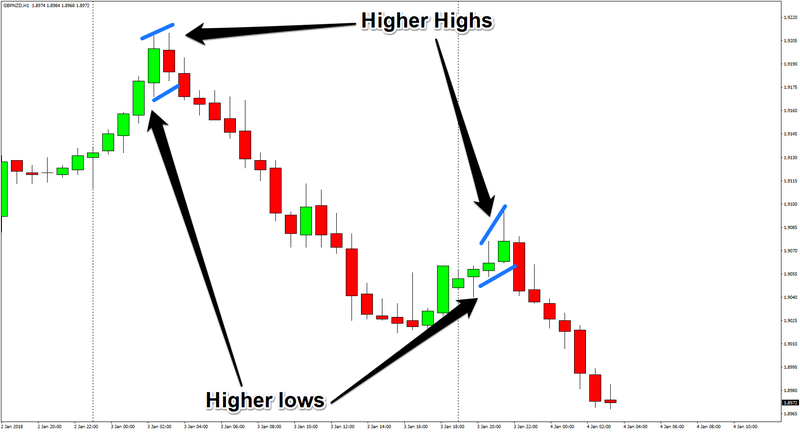 However, the underlying essence of most reversal patterns are “higher highs, higher lows” for bearish reversal patterns and “lower lows, lower highs” for bullish reversal patterns. Basically, the plan is to create entry rules based on the inside bar and those exhaustion patterns. And to complete the system, I just have to slap on some rules for managing the trade, as well as rules for exiting the trade. Easier said than done! Okay, I’ve got goals, I have defined my parameters, and I have identified the “core” around which I’ll start building my trading system. It’s now time to start creating a prototype! Wish me luck! And hopefully y’all also picked up a few things from this write-up! And as always, I enjoy getting your feedback. And I’d be especially happy to hear from you if you also decided to create your own trading system from scratch this year. So don’t be shy and write a comment down below! If our planned systems are similar enough, we can even bounce ideas off each other and hopefully create a better trading system while also improving faster as traders.